Oh my gosh! 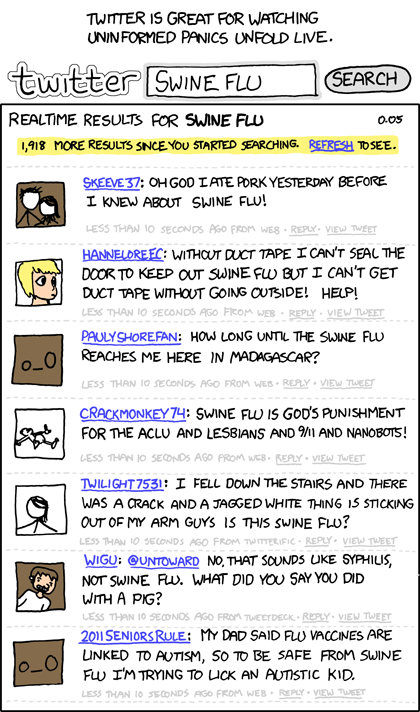 There are over 20 cases of Swine Flu reported in Alberta and it's a bit scary! I'm a bit concerned about it because I meet several people in my work and I can bring the H1N1 Virus to my home so I really need to practice proper handwashing. Although I'm very careful about it I'm scared that we might still contract the Swine Flu because my brother lacks good personal hygiene. He is really such a pig. Just this afternoon a customer was saying that she doesn't eat meat so she won't get the flu. But the thing is eating the meat of an infected pig won't cause someone to contract the swine flu because swine flue is only transmitted from human to human. Although it can be contracted from swines too but not from eating them.